Is an Aging Population—or Slow and Unequal Wage Growth—our Biggest Challenge? The release of the Social Security Trustees Report, just announced for July 28, usually prompts alarmist commentary on the burdens of supporting an aging population. A recent Congressional Budget Office report fanned the flames by identifying aging as the key driver of long-term growth in federal spending, accounting for 55 percent of the projected growth in federal spending on Social Security, Medicare, and Medicaid as a share of GDP over the next quarter century. Aging eclipsed excess growth in health costs above general inflation (24 percent of the increase) and the expansion of federal health care programs under the Affordable Care Act (21 percent). Aging appears to loom larger because health cost inflation slowed after ACA’s passage. Despite this positive development, CBO projects that by 2039 federal debt as a share of GDP will almost match the record set after World War II, even as federal revenues increase relative to the size of the economy. If aging is as inevitable as death and the Republican aversion to taxes, cuts to large social insurance programs benefiting seniors would seem to be the only way to prevent the federal debt from ballooning. Not so fast. While CBO analysts should be given the benefit of the doubt when it comes to producing unbiased projections, how these projections are framed is not immune to politics. And while both the current and former CBO directors are known for their expertise in analyzing health costs, Peter Orszag, who stepped down as CBO director to become President Obama’s budget director, emphasized the need to rein in health costs through government action, whereas his successor, Douglas Elmendorf, has been more skeptical of government’s ability to do so, going so far as to dismiss ACA provisions designed to restrain health costs in CBO’s influential “alternative” projections. 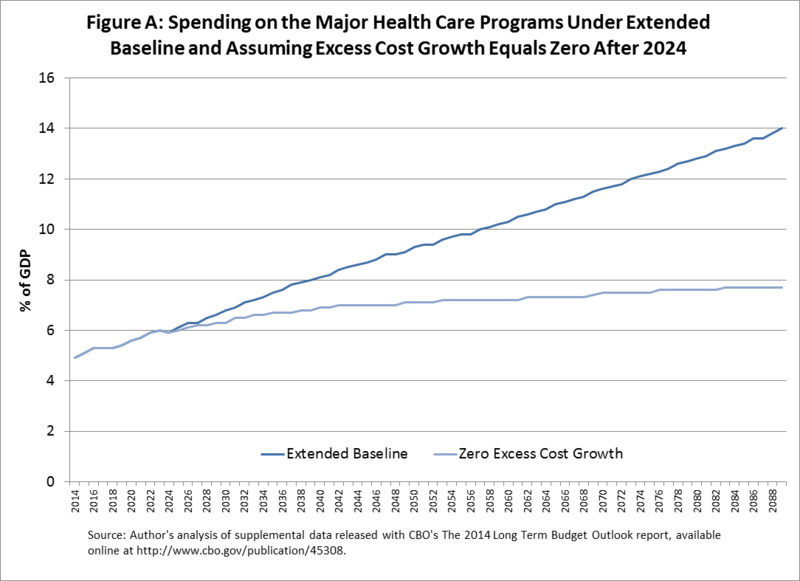 Under Orszag’s direction, CBO outlined how projected cost growth could be attributed to an aging population, excess health cost growth, and—importantly—the interaction between the two (an aging population consuming more expensive health care). This showed at a glance that costs were expected to rise with the retirement of the Baby Boomers, then level off if health costs could be brought under control. Under Elmendorf’s direction, CBO initially provided this information, but later began lumping in much of the interaction effect with “aging,” making it very difficult to see what would happen to federal spending in the absence of excess cost growth. Which gets us back to the alarming-seeming estimate that 55 percent of spending growth over the next quarter century could be attributed to aging. This tends to make benefit cuts, as opposed to cost containment measures, appear unavoidable. But buried in the supplemental data published with the current report are projections showing how spending on federal health programs would grow with and without excess cost growth, giving a very different impression of what is driving the increase in social insurance spending, as seen in Figure A, below. Though this excludes Social Security, the program accounts for only 31 percent of the projected increase in social insurance spending through 2039 and a declining share going forward, precisely because the main cost driver is an aging society rather than excess cost growth. After the Boomer retirement, Social Security costs are projected to rise much more slowly: Two thirds of the projected increase in long-term costs as a share of GDP will happen over the next 25 years and one third will happen over the subsequent 50. In any case, focusing only on costs ignores the main challenge facing social insurance programs and the economy as a whole: slow and unequal wage growth, which has not only hurt American families, but also eroded Social Security and Medicare’s payroll tax base. With healthy wage growth, the increase in payroll tax revenues that built up the trust fund in anticipation of the Boomer retirement would have been enough to accommodate this demographic bulge. 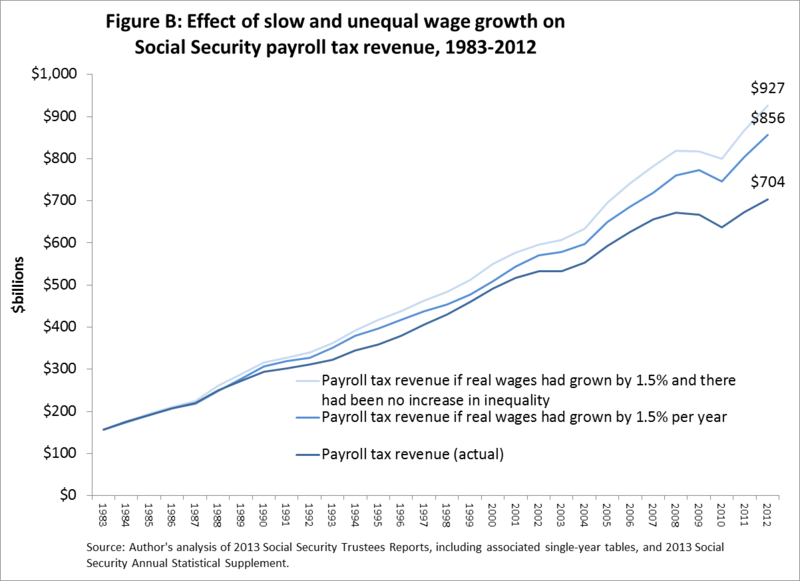 What the Social Security actuaries failed to foresee in 1983, when Social Security was last projected to be in long-term balance, wasn’t the Boomer retirement, but rather the fact that the dismal real wage growth of the previous decade, which seemed an aberration caused by high inflation, would persist. The more conservative of two “intermediate” projections in the 1983 Trustees Report assumed wages would grow by 1.5 percent above inflation. Instead, over the next three decades real wages grew by an average of 1.0 percent per year (the most “pessimistic” scenario envisioned in the 1983 report), even as productivity grew 1.7 percent annually. As you can see in Figure B, below, if wages had grown by 1.5 percent, Social Security’s revenues would have been around $152 billion (22 percent) higher in 2012. Social Security benefits would also be higher if wages had grown by 1.5 percent, but the net effect on the system’s finances would be positive. The 2013 Trustees Report, for example, estimates that real wage growth 0.6 percentage points higher than projected (in line with productivity growth) would shrink Social Security’s long-term shortfall by a third. This doesn’t take into account the damage already done by wage stagnation during the Boomers’ peak earning years. Revenues have also been eroded by inequality. As the share of earnings below the taxable earnings cap declined from 90 percent in 1983 to 83 percent in 2012, the combined effect of slow wage growth and inequality reduced revenues by up to $223 billion (32 percent). Though the 2013 Trustees Report does not provide estimates of the impact of inequality on the system’s finances, a relatively small share of the forgone revenue would have gone toward higher benefits due to Social Security’s progressive benefit structure. Dean Baker and I have separately estimated that 41 to 47 percent of the projected shortfall could be attributed to rising inequality. I also estimated that 51 percent of the shortfall could be attributed to wage growth lagging productivity growth. Though the projected shortfall has since grown, and these were back-of-the-envelope approximations rather than official actuarial estimates, it is clear that Social Security’s finances—like the finances of families increasingly dependent on Social Security—have been hit hard by these adverse trends. The long-term budget solution, as recently outlined by Dean and numerous EPI publications, should focus on expansionary macroeconomic policies and bringing U.S. health costs in line with those in other advanced economies in addition to policies designed to boost wages for low- and middle-earners, such as a higher minimum wage and defending the right of workers to unionize.